Published by The Federation Press, October 2012. Over the past four decades Aboriginal people living in remote and regional Australia have been empowered by land rights and native title laws to claim back large tracts of their ancestral lands. Today the Indigenous estate covers over 20 per cent of the continent and includes areas of globally significant biodiversity and cultural value, many now declared as Indigenous Protected Areas in the National Reserve System. But none of the Indigenous estate is in its pre-colonial condition and it faces a myriad of environmental threats. People on Country Vital Landscapes Indigenous Futures draws on a diversity of perspectives to document a significant social and environmental movement that is quietly gathering momentum across this vast Indigenous estate. This series of essays, drawn from an unusual collaboration between university researchers and Indigenous land owners, tells a little-known story about Aboriginal people who are living on, working on and caring for the lands and seas that they own and manage. The ongoing struggles by Indigenous people to conserve and rehabilitate the outstanding natural and cultural values of their ancestral lands deserve wide recognition and acclaim. This book seeks to reposition Indigenous people and their caring for country activities from the margins to the very core of the growing national conversation on issues such as climate change, biodiversity loss and resource depletion. It challenges the Australian public, policy community and politicians to re-imagine the role that the Caring for Country movement, deploying a mix of western scientific and Indigenous ecological knowledge systems and techniques, must play in the proper environmental management of Australia in the 21st century. The Centre for Aboriginal Economic Policy Research, The Federation Press and the Sidney Myer Fund warmly invite you to the launch of People on Country Vital Landscapes Indigenous Futures edited by Jon Altman and Seán Kerins. For your convenience, please see the launch invitation (416K PDF document). To confirm your attendance, please respond to Elisabeth Yarbakhsh at elisabeth.yarbakhsh@anu.edu.au or phone +61 2 6125 0648 by 02 October. Numbers are limited. Refreshments will be provided at all events. Copies of the book will be available at a special launch price. Tuesday 9th October 5.30 for 6.00-7.30 p.m. Launch by Jody Broun, Co-Chair, National Congress of Australia’s First Peoples, followed by contributions from Indigenous ranger partners and authors. Hosted by Jason Ardler, General Manager, Aboriginal Affairs NSW. Wednesday 10th October, 5.30 for 6.00-7.30 p.m. Launch by Dr Tom Calma AO, Co-Chair, Reconciliation Australia, followed by contributions from Indigenous ranger partners and authors. Hosted by Dan Gillespie, Chairperson, People on Country Advisory Committee. Thursday 11th October, 5.30 for 6.00-7.30 p.m. Launch by Monica Morgan, Indigenous Rights Program, Amnesty International, followed by contributions from Indigenous ranger partners and authors. Hosted by Professor Brian Howe AO, University of Melbourne. Tuesday 16th October, 4.30 for 5.00-6.30 p.m. Launch by Marion Scrymgour, Australian Red Cross, followed by contributions from Indigenous ranger partners and authors. Hosted by Dan Gillespie, Chairperson, People on Country Advisory Committee. 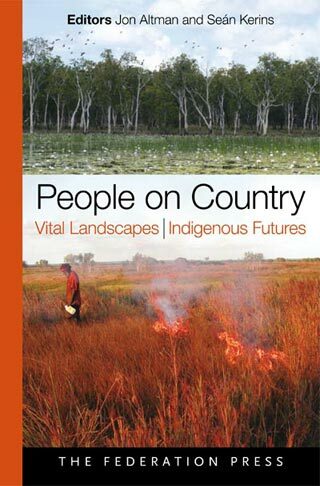 People on Country Vital Landscapes Indigenous Futures is available from good bookstores, or direct from Federation Press at a publisher’s discount price of $35.00. [288pp paperback, Australian RRP $39.95, ISBN 9781862878938].